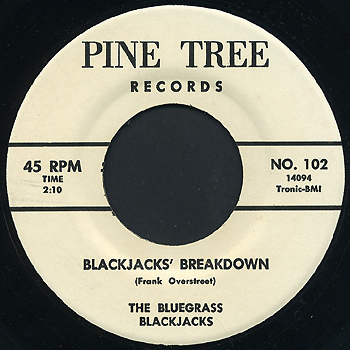 The Pine Tree label was started in 1964 in Indianapolis, Indiana, by the Bluegrass Blackjacks as a vehicle to release records by their group. After three singles, the label was sold to Melody Records in Hamilton, Ohio, which eventually released approximately 15 more singles and in excess of 50 LPs by a variety of bluegrass artists and groups. BGR 1964 A Todd-Scott Prod.